Deuteronomy 3:29 So we abode in the valley over against Beth Peor. Deuteronomy 4:3 Your eyes have seen what Yahweh did because of Baal Peor; for all the men who followed Baal Peor, Yahweh your God has destroyed them from the midst of you. Deuteronomy 4:46 beyond the Jordan, in the valley over against Beth Peor, in the land of Sihon king of the Amorites, who lived at Heshbon, whom Moses and the children of Israel struck, when they came forth out of Egypt. Hosea 9:10 I found Israel like grapes in the wilderness. I saw your fathers as the first ripe in the fig tree at its first season; but they came to Baal Peor, and consecrated themselves to the shameful thing, and became abominable like that which they loved. As the Sun-god, Baal was worshipped under two aspects, beneficent and destructive. On the one hand he gave light and warmth to his worshippers; on the other hand the fierce heats of summer destroyed the vegetation he had himself brought into being. Hence, human victims were sacrificed to him in order to appease his anger in time of plague or other trouble, the victim being usually the first-born of the sacrificer and being burnt alive. In the Old Testament this is euphemistically termed "passing" the victim "through the fire" (2 Kings 16:3; 2 Kings 21:6). The forms under which Baal was worshipped were necessarily as numerous as the communities which worshipped him. Each locality had its own Baal or divine "Lord" who frequently took his name from the city or place to which he belonged. Hence, there was a Baal-Zur, "Baal of Tyre"; Baal-hermon, "Baal of Hermon" (Judges 3:3); Baal-Lebanon, "Baal of Lebanon"; Baal-Tarz, "Baal of Tarsus." At other times the title was attached to the name of an individual god; thus we have Bel-Merodach, "the Lord Merodach" (or "Bel is Merodach") at Babylon, Baal-Melkarth at Tyre, Baal-gad (Joshua 11:17) in the north of Palestine. Occasionally the second element was noun as in Baal-Shemaim, "lord of heaven," Baalzebub (2 Kings 1:2), "Lord of flies," Baal-Hamman, usually interpreted "Lord of heat," but more probably "Lord of the sunpillar," the tutelary deity of Carthage. All these various forms of the Sun-god were collectively known as the Baalim or "Baals" who took their place by the side of the female Ashtaroth and Ashtrim. At Carthage the female consort of Baal was termed Pene-Baal, "the face" or "reflection of Baal." In the earlier days of Hebrew history the title Baal, or "Lord," was applied to the national God of Israel, a usage which was revived in later times, and is familiar to us in the King James Version. Hence both Jonathan and David had sons called Merib-baal (1 Chronicles 8:31; 1 Chronicles 9:40) and Beeliada (1 Chronicles 14:7). After the time of Ahab, however, the name became associated with the worship and rites of the Phoenician deity introduced into Samaria by Jezebel, and its idolatrous associations accordingly caused it to fall into disrepute. Hosea 2:16 declares that henceforth the God of Israel should no longer be called Baali, "my Baal," and personal names like Esh-baal (1 Chronicles 8:33; 1 Chronicles 9:39), and Beelinda into which it entered were changed in form, Baal being turned into bosheth which in Heb at any rate conveyed the sense of "shame." Temples of Baal at Samaria and Jerusalem are mentioned in 1 Kings 1:18; where they had been erected at the time when the Ahab dynasty endeavored to fuse Israelites and Jews and Phoenicians into a single people under the same national Phoenician god. Altars on which incense was burned to Baal were set up in all the streets of Jerusalem according to Jeremiah (11:13), apparently on the flat roofs of the houses (Jeremiah 32:29); and the temple of Baal contained an image of the god in the shape of a pillar or Bethel (2 Kings 10:26, 27). In the reign of Ahab, Baal was served in Israel by 450 priests (1 Kings 18:19), as well as by prophets (2 Kings 10:19), and his worshippers wore special vestments when his ritual was performed (2 Kings 10:22). The ordinary offering made to the god consisted of incense (Jeremiah 7:9) and burnt sacrifices; on extraordinary occasions the victim was human (Jeremiah 19:5). At times the priests worked themselves into a state of ecstasy, and dancing round the altar slashed themselves with knives (1 Kings 18:26, 28), like certain dervish orders in modern Islam. In accordance with its signification the name of Baal is generally used with the definite art. ; in the Septuagint this often takes the feminine form, aischane "shame" being intended to be read. We find the same usage in Romans 11:4. The feminine counterpart of Baal was Baalah or Baalath which is found in a good many of the local names (see Baethgen, Beltrage zur semitischen Religionsgeschichte, 1888). Baal-berith ba`al berith; Baalberith, "Covenant Baal," was worshipped at Shechem after the death of Gideon (Judges 8:33; Judges 9:4). In Judges 9:46 the name is replaced by El-berith, "Covenant-god." The covenant was that made by the god with his worshippers, less probably between the Israelites and the native Canaanites. Baal-gad ba`al gadh; Balagada, "Baal [lord] of good luck" (or "Baal is Gad") was the god of a town called after his name in the north of Palestine, which has often been identified with Baalbek. The god is termed simply Gad in Isaiah 65:11 the Revised Version, margin; where he is associated with Meni, the Assyrian Manu (King James Version "troop" and "number"). Baal-hamon ba`al hamon; Beelamon is known only from the fact that Solomon had a garden at a place of that name (Songs 8:11). The name is usually explained to mean "Baal of the multitude," but the cuneiform tablets of the Tell el-Amarna age found in Palestine show that the Egyptian god Amon was worshipped in Canaan and identified there with the native Baal. We are therefore justified in reading the name Baal-Amon, a parallel to the Babylonian Bel-Merodach. The name has no connection with that of the Carthaginian deity Baal-hamman. Baal-hermon ba`al chermon; Balaermon is found in the name of "the mountain of Baal-hermon" (Judges 3:3; compare 1 Chronicles 5:23), which also bore the names of Hermort, Sirion and Shenir (Saniru in the Assyrian inscriptions), the second name being applied to it by the Phoenicians and the third by the Amorites (Deuteronomy 3:9). Baal-hermon will consequently be a formation similar to Baal-Lebanon in an inscription from Cyprus; according to the Phoenician writer Sanchuniathon (Philo Byblius, Fragmenta II) the third generation of men "begat sons of surprising size and stature, whose names were given to the mountains of which they had obtained possession." 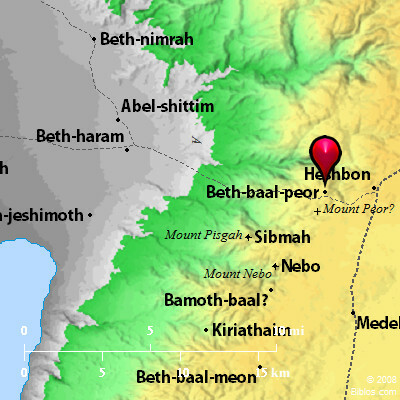 Baal-peor ba`al pe`or; Beelphegor was god of the Moabite mountains, who took his name from Mount Peor (Numbers 23:28), the modern Fa`ur, and was probably a form of Chemosh (Jerome, Comm., Isaiah 15). The sensual rites with which he was worshipped (Numbers 25:1-3) indicate his connection with the Phoenician Baal. Baal-zebub ba`al zebhubh; Baalmuia Theos ("Baal the fly god") was worshipped at Ekron where he had famous oracle (2 Kings 1:2, 3, 16). The name is generally translated "the Lord of flies," the Sun-god being associated with the flies which swarm in Palestine during the earlier summer months. It is met with in Assyrian inscriptions. In the New Testament the name assumes the form of Beelzebul Beelzeboul, in King James Version: BEELZEBUB (which see).